Recently, cyanobacteria and cyanotoxins have become a high profile drinking water quality concern in both the United States and abroad. The combination of weather conditions, agricultural phosphate runoff, and other factors has produced water conditions that have favored the formation of cyanobacteria in surface water supplies. When certain conditions are met, these micro-organisms are able to grow excessively in surface water sources, forming efflorescence and producing unwanted chemical substances, including cyanobacterial toxins. 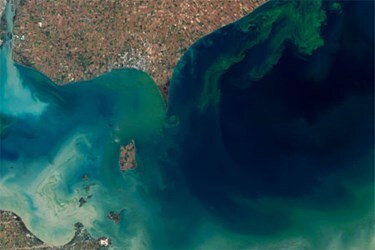 Large blooms of cyanobacteria have threatened drinking water supplies, forcing municipalities to restrict water usage and modify their water treatment practices. The issue of cyanobacteria and cyanotoxins is not new; the World Health Organization (WHO) released a provisional drinking water guideline for microcystin-LR of 1 ppb in 1998, and the EPA’s Office of Water has listed both cyanobacteria and cyanotoxins on the first three drinking water Contaminant Candidate Lists (CCL1 in 1998, CCL2 in 2005, CCL3 in 2009). However, the lack of standardized analytical methods has led to slow development of formal drinking water standards for these compounds. While EPA is considering adding cyanotoxins to the Unregulated Contaminant Monitoring Rule (UCMR), to date these compounds have not been included (although it should be noted that EPA may include microcystin-LR and cylindrospermopsin in UCMR4 in 2015). In the US, several states have implemented guidelines for cyanotoxins; three states (Minnesota, Ohio, and Oregon) have adopted guidance values for drinking water supplies for these compounds, and twenty states have adopted guidance values for recreational waterways. These guidance values, while not formal standards, at least provide some assistance to municipalities that have to periodically deal with harmful algal blooms (HABs).